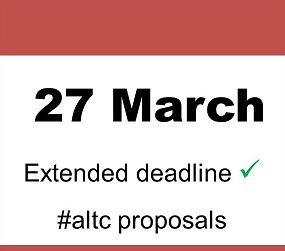 The Call for Proposals is now open and the deadline has been extended to Midnight BST, Monday 27 March 2017. Submit your ideas for a poster, lightening talk, presentation, panel, demo, workshop... or make a wildcard submission. You can view it as a Google Doc or download a PDF. 1 hour: workshop or panel discussion, fully interactive format. Please see the full Call for further information and guidance on how to submit your proposal. 4. You can track the progress of your submission at any time from the ‘User Home‘ page.